DutchCrafters pedestal dining table feet are available in the our contemporary looking empire style or the traditional more country claw style. These dining room table parts are made in a variety of solid woods. Consider oak, white ask, alder, cherry, maple, mahogany, and many other varieties. 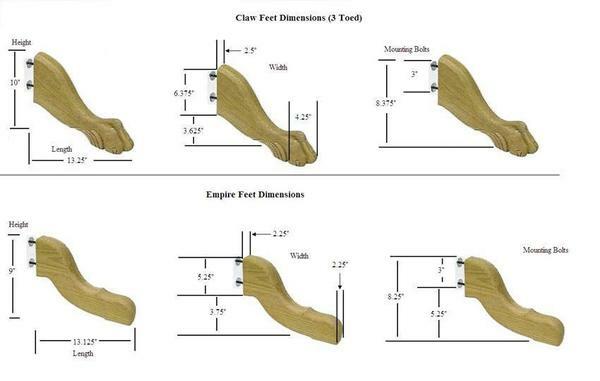 Whether you're building a table uniquely for your family or replacing parts, you can count on these Amish made table feet. They are compatible with any of our pedestal table columns. The price is per foot, not as a set. These feet come with nuts and two bolts each, pre-installed into the feet. Simply drill the holes into the table column, insert the bolts through the holes with washers as appropriate, and tighten the nut to the bolt from the inside of the column. We do not carry caster wheels for our pedestal feet. We also offer several options for extension slides, including Unfinished Five Rail Double Equalizer Slides. All of our Amish furniture and furniture parts are proudly made in the USA! Width: 2 1/2" wide at the base, and a maximum of 4 1/8" wide at the toe. Nuts and preinstalled bolts are included. The price is per foot not as a set.